In Project 2013, a baseline is intended to be a frozen picture of the project plan that remains sacrosanct and never changes. Well, that’s the theory. In practice, events can make an original baseline less than useful — and even obsolete. For example, if a project that spans four years from beginning to end, you may want to save a new baseline every year because costs increase or resources change. Then you can see incremental versions of the estimates that reflect the changes you made based on changes in the real world with Project 2013. In contrast, a project that starts with a well-thought-out baseline plan can change a week later when the entire industry shuts down from a massive strike that lasts for three months. All original timing estimates then become bogus, so you would adjust the plan instead, save a new baseline, and move ahead after the strike is resolved. To clear the baseline for only certain tasks, select them. 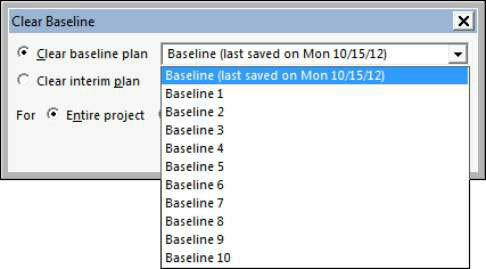 The Clear Baseline dialog box appears, with the Clear Baseline Plan option selected by default. From the Clear Baseline Plan drop-down list, choose a baseline to clear. Select either the Entire Project radio button to clear the baseline for the entire project or the Selected Tasks radio button to clear selected tasks. The project baseline is cleared or selected tasks are cleared.